I (Nadia) am a radio documentary student at the Salt Institute of Documentary Studies in Portland, Maine and am interested in doing a story on a Real Life Superhero in Maine. If any RLSH would be interested in speaking to me or suggest any other Real Life Superheroes I should contact, I'd be most grateful! If anyone would be interested in adding their voice to a documentary record of the Maine superhero scene, or in giving Nadia any hints as to where else she can look for activity, please do contact her. Thank you! According to MPBN's site, a massive lobster was caught off the coast early this weekend. Holy moley! Would love to see a picture of this feller. BOOTHBAY HARBOR, Maine (AP) _ A giant 27-pound lobster has been caught off the Maine coast, but it won't be going into a pot of boiling water. Maine State Aquarium Director Aimee Hayden-Rodriques says Cushing shrimp fisherman Robert Malone caught the monster crustacean in his nets Friday. He gave it to the Department of Marine Resources to deliver to the aquarium which the DMR operates in Boothbay Harbor. The beast weighed in at 27 pounds and measured nearly 40 inches long. It was dubbed Rocky because it was caught in the Rockland area, but Hayden-Rodriquez says it could have been named for Rocky the boxer because its claws are big enough to pack quite a punch. Hayden-Rodriquez says Rocky will soon be released into the ocean because he'll fare better in the wild. James Wetherell, Co-Director of Central Maine Paranormal Investigations (CMPI), is teaming up with Andrew Graham, founder of Research of New Hampshire (NEARNH) to host their first ever paranormal conference. The conference is slated to be held in a location still to be determined, with a convenient placement somewhere on the New Hampshire Maine border. The date for the conference is Columbus Day weekend, Oct 6th-7th, 2012. They are currently working out the logistics, including the exact location. Meanwhile, they are looking for speakers and vendors to participate in the event. They also want to put the word out to anyone interested in attending as guests to stay tuned for more info. ELIOT, Maine — A home intruder ran afowl of the law this week, making for a most unusual day for Eliot police Officer Dave Arsenault. Arsenault responded to a Garrison Drive residence around 3:45 p.m. Dec. 26, after the owner reported coming home and hearing something moving upstairs. On inspecting the outside of the house, the owner found a broken window in a second-story bedroom. As Arsenault entered the house, he, too, heard the noise and thought he'd caught a burglar red-handed. With gun drawn, the officer began a systematic search and when he arrived at the door of the bedroom where he'd heard the noise, he prepared for confrontation. Kicking the door open, he found himself facing not a burglar but a wild tom turkey. "It appears as if the turkey flew into the window and gained entry to the room. It was basically trapped, and it was quite frustrated," Police Chief Theodor Short said. Arsenault and the homeowner tried unsuccessfully to throw a sheet over the bird, which did not appear to be injured. Eventually, the turkey found his way to the window and out on his own. "I guess you could say he flew the coop," Short said. This article appears in the current issue of the Strange Maine Gazette. Some of you might have heard me discussing it with DanK on WMPG's "Random Thought Crime Generator" radio show last night. Here it is in all its length for your reading pleasure! Moss-covered granite slabs from an old foundation. Those of you who attended my author talk at the Lithgow Public Library in Augusta during spring 2011 will recognize some of the material in this article from that evening, when I was first feeling my way through a maze of a couple centuries’ worth of town records in an attempt to sum up Maine’s ghost town history. If any of you kind Augustans are reading this, thank you for your patience as I tried to find my legs that night! Ghost towns are most typically assumed to exist in the Old West, and particular imagery is associate with them – tumbleweeds blowing through dusty streets, old woodframe buildings silvered with weathering, abandoned shopfronts, a straggling huddle of buildings in the middle of the desert or the mountains. As the desolate wind howls through what used to be Main Street, a shutter or two bangs restlessly, startling unwary visitors, and at night the coyotes howl in the distance. It wasn’t until I read William F. Robinson’s book, Abandoned New England, that it occurred to me that Maine has its own ghost towns. Our state’s most famous ghost town is Flagstaff Village, which today lies at the bottom of Flagstaff Lake, visited by many each year as part of the Appalachian Trail. But Flagstaff is not alone. Maine is peppered with ghost towns of varying size, left in settlers’ wakes as waves of citizens tried their hands at taming the land, attempting to balance making a living and making a livable home from available resources, and sometimes failing. But what is a ghost town? The most succinct definition I found describes one as “a town where few or no people now live,” while the Merriam-Webster Dictionary is more specific, entailing “a once-flourishing town wholly or nearly deserted usually as a result of the exhaustion of some natural resource.” Maine has many abandoned town sites that fit into the second category – the industrial age certainly took its fickle toll on our state. However, not all of our ghost towns were based around the plundering of natural resources. A smattering of Maine towns were formed around more idealized concepts. Many represented new starts for groups of settlers, some as religious communities, while others seem to have started simply as a common collecting point for previously unassociated frontier families looking for others to live near. A unique example of a town’s founding is that of Freeman Ridge, which was formed by survivors of the burning of Portland (then called Falmouth) during the Revolutionary War. The land was granted to them by the state of Massachusetts (of which Maine was then a part) in the wake of that devastation, and was the westerly one of two such relief grants, the other being New Portland. Freeman was surveyed and settled around 1797, incorporated in 1808 (despite various sources citing dates ranging from 1803 to 1807), and repealed it incorporation in 1937. Like many ghost towns, its population peaked early, and then declined steadily. A large part of Maine’s ghost town heritage revolves around the use of land by timber companies and other major business concerns, including but not limited to hide tanning, slate or granite quarrying, organized seasonal recreation, grain milling, sheep farming, rough iron mining, and ice harvesting. Land would be acquired to turn a profit from whatever resources existed there – lumber, quarrying stone, or other – and in the process, some land might be leased to workers of the company, or others looking for affordable land in the area. Land leasing from the big companies has always been a tricky business. There is no guarantee, even today, that the ownership won’t suddenly decide that they need your land, and that you need to vacate the premises in short order. Sort of like the private business version of eminent domain. Some of Maine’s more famous ghost towns have resulted from this sort of short-notice abandonment of property, like Hurricane Island. Located off the coast of Rockland near Vinalhaven, and owned by Civil War veteran General Tillson, “Hurricane was supposed to be a chartered town but Tillson made it a company town.” Like most company towns, the general store and most of the houses were owned by Tillson’s business. The end of Hurricane was abrupt. As assessed in the brief article, “Four Disappeared Towns and One Mighty Tiny One” in the Maine Times, “the people of Hurricane Island were said to have left the sheets on their beds when they left in 1915.” All it took was word from the quarry manager that Tillson’s company was about to go bankrupt. Workers and their families vacated the island in a mere days. Residents of nearby Vinalhaven Island allegedly ferried away the lumber from the residences and buildings, and only the foundations and the quarry pits were left behind. [Source: Maine Times 12/19/1980, pg 20] Since 1963, the subsequent private owner of the island has leased a portion of the island to Outward Bound, resulting in the now-famous island-named wilderness survival school. The tremendous, multi-story cliff that was created by quarrying out granite from the island bed is now used by the school to teach rock climbing. Others, like Flagstaff Village and its neighbors Bigelow Plantation and Dead River Plantation, suffered their fate in the name of hydropower. In 1948, after two decades of rumors, Central Maine Power took final steps to organize the damming of Dead River. A 1927 legislative bill had allowed CMP to utilize eminent domain to seize land necessary for damming in order to provide more reliable power to the state’s population. The citizens of Flagstaff Village, Bigelow Plantation, and Dead River Plantation found themselves with little choice. They had to sell their homes to CMP or face the inevitable fate of having their homes flooded out from under them. Many moved to nearby Eustis, forming the New Flagstaff neighborhood. Family graves from the town graveyards were reinterred in Eustis, and even a few houses were moved to new ground ahead of the floodwaters. Even Captain Wing’s daydream of building a big Noah’s ark for everyone seemed wistfully futile. Nothing was going to avert the dissolution of this close-knit community, and by late 1949 the town was abandoned to the encroaching waters. In March 1950 a newspaper headline summed up the ordeal’s end: “Creeping, Watery Death to Smother Beauties of Spring in Rural Flagstaff. All Roads Are Cut. Residents Gone as Reservoir Grows.” Soon Flagstaff Lake was in residence, the second largest lake in Maine, and the only one I know of with the curious relics of a town lurking in its lower levels. The years have smoothed the outlines of the town streets and foundation holes, making it difficult to discern them even when the lake’s water level is cooperatively low, but visitors still find old kitchen utensils and other traces of the community’s daily life when wading in the shallows of the lake. However many towns fell by the wayside in the wake of the brutal plunder of commerce, some dissolved from pure lack of volition, and what their better-organized neighbors felt was their sure moral and civil dissolution. Early Maine towns also disbanded when tragedies occurred, such as the death of the town founder or benefactor. Other towns fell by the wayside as farming practices changed, transportation expenses rose, railroad and ferry lines shifted their operations, changing age demographics caused closure of the local schools, or too many non-residents took over land, causing tax-collection trouble. The arrival of gas-powered engines also did its own share of shifting, as traffic and citizen needs changed accordingly. Communities that depended on boats found it necessary to move closer to gas supplies as they shifted to using gas-powered motors to increase their vessels’ productivity. Train lines shrank and went out of service as trucks took over much of the shipping industry. The Great Depression took a heavy toll, as did the needs of quick modernization after World War II, when citizens began demanding reliable access to phone and power lines. Clearly Merriam-Webster’s summation of what “ghost town” means does not adequately convey all the complexities involved. The early use of the term ghost town dates from 1931, according to Merriam-Webster, and it seems about this time that a greater civic awareness of humanity’s condition in out of the way places, and the drive to improve it (often whether or not the locals perceived of themselves as needing improvement) began making regular appearances in print publications, of both professional and layperson readership. An example of this would be the publication an article by O. J. Scoville, which found its way into the August 1937 issue of The Journal of Land and Public Utility Economics, titled “Liquidating Town Government in Decadent Rural Areas of Maine.” I don’t think they were using the word “decadent” in a way that we are accustomed to today, when it tends to reference a dissolute state of luxury and excess! Ghost towns, despite their name, are not necessarily completely dead. Some are absorbed into nearby towns, and some even continue today, eking out an existence as an unorganized township, or existing unnamed on the edge of a more developed town. Some ghost towns cycle back to life, as the allure of the small town lifestyle attracts people from the rest of the country to Maine’s rural areas, locations which are perceived to present a simpler, more affordable, self-sustaining opportunity, and the type of community which is supposed to be a good place to raise a family. It’s not surprising that a lot of ghost towns linger in Maine’s limbo of Unorganized Territories (UT), but I was a little astonished to find that the unorganized territory of Maine accounts for just over half the area of the entire state, which translates to a lot of open area. I hadn’t paid much attention to Maine’s UT until I started looking for locations to send copies of the Gazette in search of a wider Maine audience. To my surprise, I found huge swathes of land in the northern and western regions of the state where there simply weren’t any substantial population centers! The Main Streets, the cafes, all those little niceties of town life that we here in the southern part of the state take for granted, just disappear for huge areas across the map, swallowed up by the piney forest. So I did some more research about this mammoth part of the state that doesn’t have as many folks to speak for it. 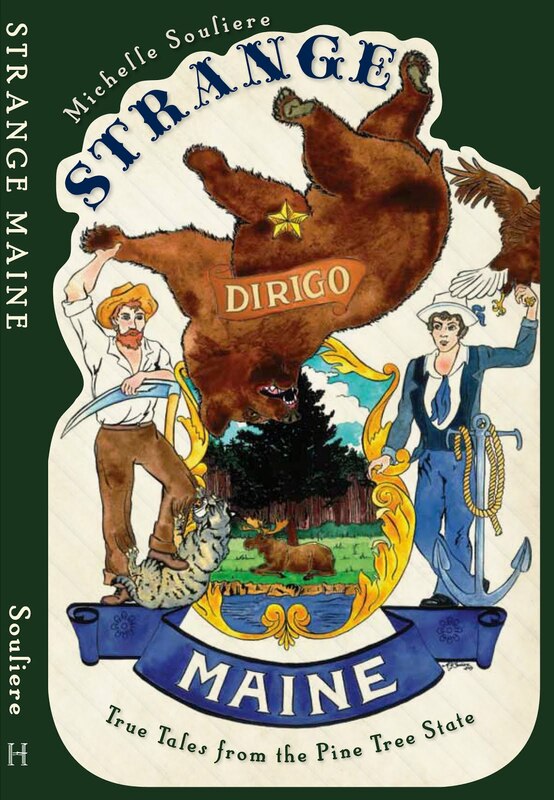 Maine’s Unorganized Territory is made up of over 400 townships, as well as many coastal islands that are not located within the bounds of nearby mainland towns. Out of Maine’s U.S. Census population total of 1,328,361, only about 9,000 live permanently in the Unorganized Territory, although that population swells with seasonal residents each year. Many Maine ghost towns are now seasonal recreation locales, attracting tourists and visitors to their area in the warmer months or during hunting and winter sport season. A select few have even become historic sites, maintained as part of Maine’s park service system, a unique educational opportunity which other New England states such as New Hampshire have also fostered. See Recommended Reading below for a great NH guide book to these sites in our neighbor state. How do you know if you’ve stumbled across a ghost town site? Few are easy to find if you set out with that goal in mind, since identifying markers have crumbled or been removed as the area’s status changed. Ghost towns are far more likely to be discovered by accident during a tromp in the woods. You may find clusters of cellar holes and accompanying stone walls, indicating a defunct farming community like the towns of Montville, Knox, and Morrill, now dissolved and recombined into the Frye Mountain Wildlife Management Area. Or you may be lucky enough to stumble across the remains of outbuildings, or old unpaved access roads which have yet to be overgrown by rampant nature. Think in terms of where settlements would have formed, and why. Most communities needed a mills nearby as settlers had to be able to get their grain ground for flour, and lumber cut to built with. Mills required a good source of water energy to run productively. Maine has lots of rivers and lakes which provided this important resource to newcomers. Early ghost towns will be in locations which are well-placed to allow the survival and sustenance of a growing population, while later ghost towns often gravitated to locations further afield where industry was created out of lumber, stone, or other raw material in the area, supplemented by a nearby railroad or carriage road system. Access to a transportation network was essential for these later settlement, both for importing harder-to-find supplies to fill the needs of employees and their families. Tracking ghost towns through records is also tricky. For example, when researching Freeman Ridge, there are multiple “previous designations” for the Freeman area (located between Kingfield and Strong), including: Township No. 3, 2nd Range North of Plymouth Claim, West of Kennebec River (T3 R2 NPC WKR); Little River; West Falmouth; and Falmouth Township. Beyond the recorded names, you find additional anomalies such as the fact that residents were enumerated as living in “West Portland” in the 1800 census. As if that wasn’t enough, part of Freeman was set off to form North Salem (now Salem Township) in 1823, and another part was set off as part of New Portland in 1833. As with many other topics of historic research, it is like looking for a needle in a haystack – a haystack that just keeps growing larger the longer you dig! Although I only mention a small sample of Maine’s ghost towns here, my initial research turned up at least a couple dozen sites, and those signify just the first brief casting of the net. There are many more out there, “moldering in the forest and collapsing under the pressure of sprouting trees and strangling bittersweet vines,” to quote Jeff Clark of Down East. Some lie just off heavily traveled roads, while others have relinquished themselves in more solitary surroundings, tucked up against mountains or at the far end of long-defunct railway lines. Like the ghost streets of Portland, their time has passed, but traces of them still linger if one brings a searching eye to their old neighborhoods. The Portland Press Herald had a great article by Edward Murphy on January 27th about one of Portland's historic mysteries. About a year and a half ago Andrew Graham, quoted in the article below, emailed me wondering where the original wooden Portland Resurgam phoenix was, when he encountered nothing but "a soul-less reproduction" at Key Bank. Apparently he's kept asking around! Here's hoping the article will help find the sculpture, where ever it is today! Mystery surrounds this relic from Portland's fiery past. PORTLAND — A carved wooden phoenix is proving just as elusive as the mythical creature it depicts. The phoenix was carved for the facade of one of Portland's oldest banks just after the Great Fire of 1866 scorched a large swath of the city. It survived more than 60 years of exposure to Maine's harsh weather, then another 70 years or so inside bank lobbies. But it disappeared about a decade ago, and no one knows where it has nested since, or whether it still exists. "It's just dropped out of sight inexplicably," said Andrew Graham, president of Creative Portland, who said he has admired the carving since it appeared in an exhibit in the 1970s. Graham is helping to lead an effort to track it down. A replica of the phoenix, apparently made of fiberglass, is in KeyBank's Monument Square branch. The original was commissioned by Canal Bank in 1866, when the bank rebuilt after the fire and moved its headquarters to Middle Street. Portland added the phoenix to its municipal seal in the 1830s. Canal Bank executives apparently wanted to draw on that inspiration as the city tried to recover from the fire in 1866. The craftsman is unknown, but probably was a ship's carver who was skilled in carving wooden figureheads, said William Barry of the Maine Historical Society library. "It's an icon," Barry said. "It was considered a local treasure. What happened to it, I don't know." The bank put the carving on its building's roof line, where it stayed until the structure was expanded around 1930. Around that time, the phoenix was put in the bank lobby. It was moved next door, to KeyBank's Canal Plaza branch, after mergers put Canal Bank under the Ohio bank's corporate wing. KeyBank moved the bird to its Monument Square branch in 2004. Spokeswoman Therese Myers said she thought it was the original, but a comparison with a picture of the original in a book on Maine art shows significant differences. "It seems that we are not sure whatever might have happened to the original," said Sherry Brown, KeyBank's regional marketing manager for Maine and Vermont, in an email in August. "Apparently it was built in pieces, so we fear it may have been destroyed or trashed and not kept." Brown could not be reached for comment this week. Earle Shettleworth, Maine's state historian, said the city deserves a better answer. "It's certainly one of the great symbols of the city and we ought to know where it is," he said. 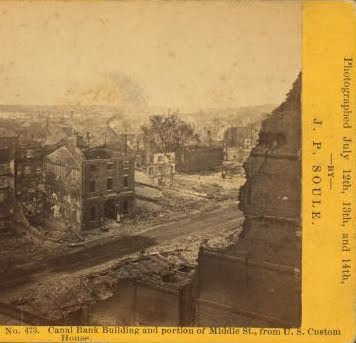 The photo below, from a stereoview in the New York Public Library digital archives, shows the Canal Bank building after the fire in 1866. 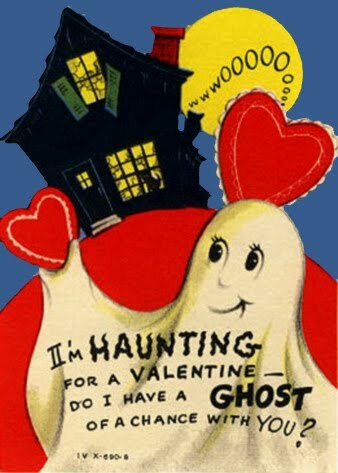 WHAT: Valentine’s Ghost Hunt, Benefit for Pemaquid Watershed Association WHEN: Saturday, Feb. 11th, 9:00pm-1:00am WHERE: Rufus Flye House, Damariscotta, Maine FMI: call Mysterious Destinations at (207)380-4677 or mysteriousdestinations@gmail.com, or visit http://mysteriousdestinations.com/ A quest for evidence of paranormal activity at the Rufus Flye House in Damariscotta will be just in time for couples seeking something different to do on Valentine’s Day weekend. The event even includes a romantic dinner, although the ambience will take a turn towards the technical during a briefing on how to use equipment to detect paranormal activity, when guests will also learn information about the building’s history and reported hauntings. The “Midnight Explore” is scheduled for Saturday, Feb 11th, 2012, from 9 p.m. to 1 a.m. It will be hosted by Mysterious Destinations, a Damariscotta-based company that has coordinated many such events. A portion of the proceeds from the event will go to benefit the Pemaquid Watershed Association (PWA), whose offices are in the Rufus Flye Building; which is also home to the Damariscotta Region Chamber of Commerce (DRCC) and Salt Bay Café. Two prior Midnight Explores at the location have netted $200 in donations to the PWA. After dinner is finished, participants will use equipment provided by Mysterious Destinations in an effort to seek out signs of paranormal activity and contribute to a growing collection of information about the building. Several unexplained images have appeared in photographs, a number of electromagnetic fields in the building are being studied and weak electronic voice phenomenon have been recorded. During a Midnight Explore on October 15, 2011, two participants experienced some unusual circumstances using dowsing rods. The recent history of the Rufus Flye House has no shortage of reports regarding the possibility of paranormal activities. According to Salt Bay Café owner Peter Everett, late night and early morning incidents began occurring shortly after he purchased the business in the late 1990’s. Often, a side door was heard to open and close, followed by heavy footsteps moving up the stairs and into the second floor of the restaurant. Employees who thought they were working alone in an empty building would go to investigate, and find no indication that anyone had entered. These occurrences were so common that over the years most employees have come to take them in stride. But some reports are bit more disturbing. The first report of an employee called by name was over 5 years ago, but that manifestation has continued into the present with another employee who has heard her name called out twice – as though the person were right behind her – in a completely empty room. As recently as July 3, 2011 Peter Everett reported that he was alone at the end of the night in the upstairs office when he observed a vertical mist pass through the room and disappear through a wall. A number of reports and photographs on the Rufus Flye House are published online at www.MysteriousDestinations.com. “This will be a great opportunity in that we will exploring all three floors of this unique building, and one with a long and solid history of manifestations,” said Sally Lobkowicz, Director of Mysterious Destinations. The fee for the Midnight Explore and dinner is $45 per person and includes a full dinner and use of paranormal detection equipment. A donation to the PWA is included in the fee. The group’s size is limited due to both the size of the building and the availability of equipment, so reservations will be accepted on a first come, first serve basis. To make reservations, or for more information, contact Mysterious Destinations at 207-380-4677 or mysteriousdestinations@gmail.com.